How often do you typically play games on your mobile phone or tablet? 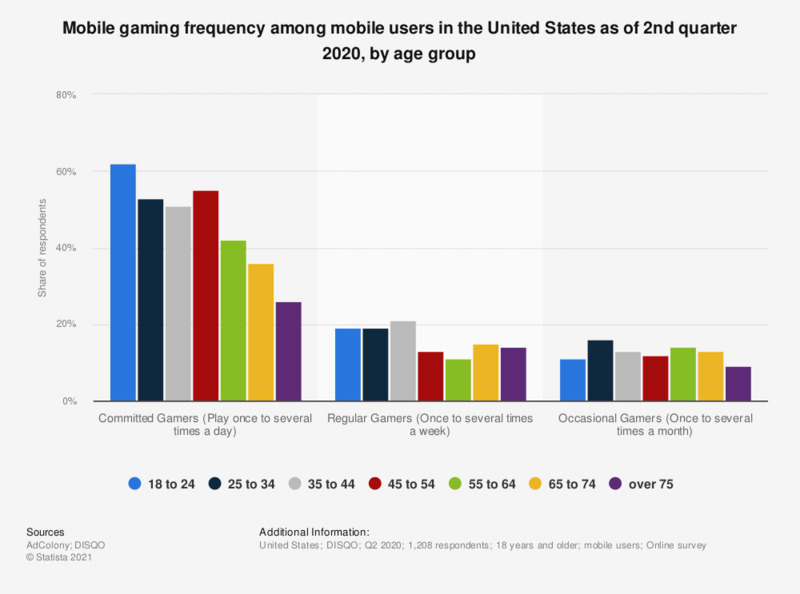 This statistic gives information on the frequency of mobile game play of mobile gamers in the United States as of May 2013. During the survey, it was found 45 percent of gamers who only played mobile games via phone accessed mobile games on a daily basis. Which of the following best describes the type of mobile device you use when playing mobile games? What percent of the time do you spend playing games on the following devices? How long have you been playing games on a mobile phone or tablet? When was the last time you played a game on a mobile phone or tablet? How many total hours per week do you play games on a mobile phone or tablet? What has influenced the increase in your mobile game play? Which of the following mobile gaming purchase activities have you performed in the last year? How much did you overall spend on mobile gaming for your phone or tablet in the past two years? How often do you use your tablet to play games?